Estimates of the sea level rise that will result from continued global warming continue to increase, with two recent papers adding more evidence that the IPCC AR4 projections were unrealistically low. The rise this century could be as high as 1.9 metres, and the long term response to a warming limited to 2ºC could be 6 – 9 metres the studies suggest. There are also signs that New Zealand planners are beginning to take the issue seriously, with Nelson and Wellington both considering the impacts of sea level rises of over a metre. If our method presents a reasonable approximation of the future sea-level response to global warming, then for a given emission scenario sea level will rise approximately three times as much by 2100 as the projections (excluding rapid ice flow dynamics) of the IPCC AR4 have suggested. Even for the lowest emission scenario (B1), sea-level rise is then likely to be ~1 m; for the highest, it may even come closer to 2 m.
Back in New Zealand, the citizens of Nelson and Wellington have both been considering the impacts of substantial sea level rise. In Nelson, a report (PDF) commissioned by Solar City NZ from the Cawthron Institute highlighted the city’s vulnerability to SLR of 1 – 2 metres. At one metre, the areas in red on the graphic at the top of the post (click for a larger version) would be liable to inundation — and that reaches deep into the city centre. At 1.9 metres (a number supplied by Tim Naish at VUW, perhaps after reading a preprint of Vermeer & Rahmstorf) all the yellow areas would be in trouble. 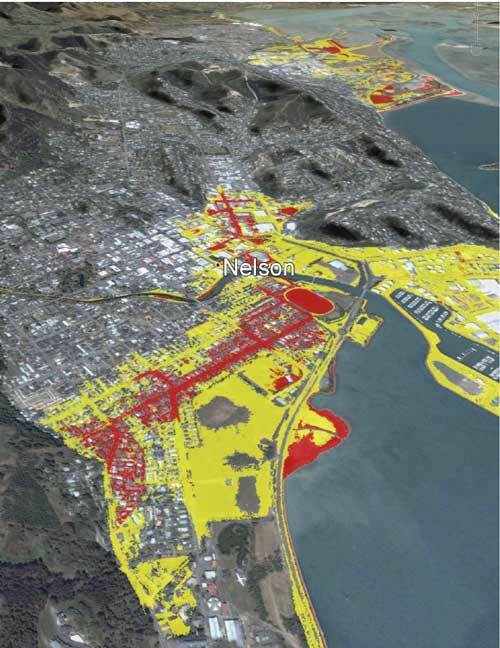 Wellington City Council, meanwhile, has been considering its climate change action plan, and was shown a graphic (shown in the Dom Post story) highlighting the central city’s vulnerability to a rise of one metre. Current advice to local government is to allow for 80cm of SLR by the end of the century and 10mm per year thereafter, but that looks to be in urgent need of revision — upwards. Reality may be harsher yet. Oddly enough I was reading that paper yesterday, and I’m saving it up for another Arctic post. I think it has implications way beyond the Arctic, although of course the issue that looms largest is what will happen to the stores of frozen carbon if there’s a too-rapid transition to the climate state described by Robinson. It seems to me that these results should be getting a lot more attention, especially considering the Tripati et al finding that CO2 only briefly spiked up to about 350 ppm during the mid-Pliocene. Assuming that that brief time was still long enough for the climate to reach equiibrium, Robinson gives us a pretty good picture of SSTs and thus of the overall climate state at that time. Tripati et al focused more on the mid-Miocene since it was the last time CO2 spent an extended period of time in the present range (and very likely they didn’t have Robinson’s results), but in that case there are plausible arguments that the planet was sufficiently different (e.g. with the Central American seaway open) so as to make it an imperfect analogy for the present. Upon re-reading Tripati et al, I notice that they went out of their way to reject DeConto’s model result that the ice sheets remain stable until much higher levels of CO2 are reached. Robinson also presents a firm challenge to the modelers since they now have a quantified target for heat transport from the tropics to the poles. If it’s TCs, the North Atlantic in particular looks like a place one would want to avoid during the summer and fall. I know all of this is way above both of our pay grades, so is there a chance you could get Tim Naish to comment on it? I haven’t read either since I’m waiting for free copies to appear, but James reminds me that the just-published Lunt et al, like Robinson a PRISM paper, explicitly proposes an equilibrium sensitivity 30-50% higher than previously, and is backed up by Pagani et al (not a PRISM paper, so presumably somewhat independent results albeit with similar methods) . Tripati promises finer-grained results soon, so we’ll see what that narrow spike looks like then, plus at some point the model-derived implications for the near future. As I replied to James, then we may get to see if people really do care about their descendants. Steve, I’ll see what I can do. Tim Naish has discussed sensitivity in the light of Andrill findings, but I haven’t pinned him down in print yet. I’ll try… but it might have to wait until the end of this Antarctic summer. At the risk of sounding Polyanna-ish, a positive side to this is that it brings major climate impacts forward, into the lives of the children and grandchildren of today’s power elites. Its a high-stakes game, but as the port cities most at risk in financial terms are in the US, India, China and Japan, one hopes that real-politik calculations of the costs of mitigation versus adaptation will increasingly favour the former. Rangi sets up a lemonade stall. Makes 1c profit on Jan 1, 2c profit on Jan 2, 4c on the 3rd. Guess what? he’s “on track” to become a millionare by Auckland Anniversary Weekend! Question: What observation would falsify the theory that we’re on track for up to 1.9m sea rise over the next 90 years? Thanks for the kook analogy Steve. “Question: What observation would falsify the theory that weâ€™re on track for up to 1.9m sea rise over the next 90 years?” – Steve Wrathall. Answer: Significant deceleration in the loss of land ice from Antarctica and Greenland might be a start. Steve, what research have you (or your puppeteers) carried out on sea levels in the Eemian interglacial? Which prestigious peer-reviewed scientific journal was it published in? Dappledwater: Wrong, at least a tenfold INCREASE in ice loss would be needed in order to get metres on SLR. There is no reason why a DECREASE need be observed in order to be inconsistent with catastrophism. Typical warmist attempt to reverse burden of evidence. RT: Which definition of peer-reviewed do you mean? “I can’t see either of these papers being in the next IPCC report. Kevin and I will keep them out somehow – even if we have to redefine what the peer-review literature is ! “Dappledwater: Wrong, at least a tenfold INCREASE in ice loss would be needed in order to get metres on SLR. There is no reason why a DECREASE need be observed in order to be inconsistent with catastrophism. Typical warmist attempt to reverse burden of evidence.” – Steve Wrathall. – the rate of sea level rise throughout the 20th century accelerated. It is now rising at 3mm per year. -The Kopp study reveals that increases in global sea level of over 1 metre per century are possible, even with the significantly smaller Greenland and Antarctic ice sheets that existed at the height of the LIG. -The warming of the LIG was as the result of orbital forcing, so the warming was much, much more leisurely than the current human induced one. – Further to the above, the speed of the current warming is anomalous – for instance, during PETM global temperatures rose 5 degrees C in the space of 10,000 years. This led to a large extinction event. We are on course for such warming within the space of two centuries. -In the last hundred years, we have had less than 1 degree C of warming, and climate scientists are expecting anything up to 4 degrees of further warming by the end of the century, under “business as usual”. This will lead to further thermal expansion in the oceans and consequent sea level rise. -The West Antarctic Peninsula has long been identified as an area of ice which could undergo rapid disintegration due to the fact that much of it’s base is below sea level. If it does begin to disintegrate, and it seems it is currently being preconditioned to do so by the current melt, then we will see an abrupt increase in sea level rise. So yes, allowing for the above, a decrease in the rate of sea level rise would sure be an indication the experts have it wrong. Steve, this is why sea level rise predictions in AR4, etc were all very conservative – none of them took these things into account because they were considered hard to accurately predict at the time. Now we do understand them a great deal better, and of course the 100 year estimate goes up by a metre or two. You write as if there is no evidence to date showing accelerating ice mass loss. But there is. If the mass loss does not continue to accelerate, the current rate of melt is very high and therefore higher levels of change in sea level can be expected in the future compared to the past. It’s like this. If I’ve been driving at 20km/h for one hour, and then start accelerating, and get to 50km/h, you can expect me to cover more distance in the next hour even if I do not continue to accelerate. It’s quite “typical” to reverse the burden of evidence when you already have it. Sorry that you felt like that, but when your own case is based on hearsay arguments and logical fallacies, you have to expect it on this site. So, Steve, you admit that those with their hands up your skirt have no scientific research on the Eemian to counter that cited above? Of course, to protect their fossil fuel profits, “doubt is their product”, which is why sock puppets such as yourself are desperately crawling over reality-based sites such as this one. The geologic record is filled with instances of a rise in the sea level or a rise in the landform or a subsidence of the landform or a subsidence of the sealevel. Makes a great 4-cell matrix. But stasis is not attainable on this planet. Now I realize that you are discussing the effects of AGW, but if the Antarctic Peninsula has the landforms underwater already, how much can it contribute to a rise in sea level? If the ice is already displacing seawater the sea wont care if it melts. Also, some have reported excessive melting and some have reported thickening of the upland Greenland glaciers? And if both are true is the effect neutral? OK, point of confusion. I have seen the reported sea level rise as anywhere from zero based on Hong Kong tide guages to well over 3mm per annum. Some have said the total rise in my grandchildren’s children’s childern’s lifetime will be 2 meters, and some have stated a rise considerably higher (Al Gore comes to mind), and some have said maybe 6 to 8 inches. Seems to me that there is a confusion or disagreement or lack of consensus on this point, and one could adopt any of the positions and point to ample evidence. Looks like there could be a lot of tectonic issues locally and any global pronouncements may be a bit off target. Just seems the whole world may have some differing local conditions due to geology and them darn rocks. Sort of depends on the actual rate of rise relative to the specific landform. In all the various predictions, is there a falsifiable assumption? In real time, not in 3 generations? It’s not the “floating” ice that is the concern, obviously it won’t affect sea levels, but rather it’s all the land ice that is. In the case of West Antarctica there is sufficient ice to raise the global sea level 5 to 7 metres, if it were to all melt (no time frame given!). The portion below sea level means it is very vulnerable to the warming oceanic currents, if that disintegrates, the buttressing effect it has on the ice behind is gone and allows the ice uphill to rapidly discharge into the sea. “Also, some have reported excessive melting and some have reported thickening of the upland Greenland glaciers? And if both are true is the effect neutral?” – Terry. InSAR analysis shows similar rates of ice mass loss. “OK, point of confusion. I have seen the reported sea level rise as anywhere from zero based on Hong Kong tide guages to well over 3mm per annum.” – Terry. Now I realize that you are discussing the effects of AGW, but if the Antarctic Peninsula has the landforms underwater already, how much can it contribute to a rise in sea level? If the ice is already displacing seawater the sea wont care if it melts. That’s true for floating ice sheets, but not grounded ice sheets like the WAIS. Basically it’s sitting on bedrock about a kilometre deep. It could go through a floating stage as it melts, after which point it would not contribute to SLR. Also, some have reported excessive melting and some have reported thickening of the upland Greenland glaciers? And if both are true is the effect neutral? However much that may have once been the case, it’s not really any more and in any case the balance of mass is surely negative. See LCROSS, GRACE, etc. you can begin to see that those who wish to feed you “hopeful” – “it isn’t too bad scenarios” don’t really know what they are talking about. The evidence is only too clear. “The 2007 IPCC Assessment, the most comprehensive and respected analysis of climate change to date, states clearly that without substantial global reductions of greenhouse gas emissions we can likely expect a world of increasing droughts, floods and species loss, OF RISING SEAS and displaced human populations. However even since the 2007 IPCC Assessment the evidence for dangerous, long-term and potentially irreversible climate change has strengthened. The scientific evidence which underpins calls for action at Copenhagen is very strong. Without co-ordinated international action on greenhouse gas emissions, the impacts on climate and civilisation could be severe.” My capitals. Now you might want to argue that the Royal Society doesn’t know what its talking about – but I for one am convinced. Guess I looked at this comment fragment by Dappledwater “The West Antarctic Peninsula has long been identified as an area of ice which could undergo rapid disintegration due to the fact that much of itâ€™s base is below sea level” and thought he meant it. Sorry. Didn’t know that when you said these things it didn’t mean what it said. Apologies. Terry, the West Antarctic ice sheet is grounded well below sea level. It is not floating, but it is very vulnerable to basal melt caused by warm sea water. We know that it has collapsed and reformed many times in the relatively recent past (see the posts linked above), but we don’t have a good constraint on just how rapid those collapses can be. “Guess I looked at this comment fragment by Dappledwater â€œThe West Antarctic Peninsula has long been identified as an area of ice which could undergo rapid disintegration due to the fact that much of itâ€™s base is below sea levelâ€ and thought he meant it. Sorry. Didnâ€™t know that when you said these things it didnâ€™t mean what it said. Apologies.” – Terry. Nice try with apportioning blame Terry, but the confusion is all yours. Only a small portion of the West Antarctic ice sheet “floats” that being the glacier face that calves into the ocean. As Gareth and Samv have pointed out, much of it is grounded below sea level. Yes “some” of that ice won’t affect sea level rise because of displacement, however the ice there is rather thick up to 2km above sea level – hence the scientific concern of it’s contribution to sea level rise. Climategate has been a sea change. Now real climate scientists realise they have to safeguard their own careers by calling the catastrophists on their BS. Lowe is also a champion of the point that any emissions reductions we do make, the system will be slow to respond to. If you take his position in that context you’ll realise he’s just saying that even if it doesn’t happen in a huge way by 2100 it still matters. What we are seeing here is the real scientific process. Scientists disagreeing over the use of different methods (note Lowe still thinks that there will be signficant sea level rise not just as much by 2100). If there is a global science conspiracy then they are doing a bad job for the cause. Also Stefan thinks that his method is valid would be very happy to be proven wrong. So, Steve the Human Sock Puppet returns! Have you got that data on sea levels in the Eemian yet?